For a child or an adult with a physical, developmental or emotional disability, life looks a great deal brighter on horseback. The warmth and movement of the horse strengthens and tones muscles, improves balance, head control and coordination, builds self esteem and offers a sense of freedom. For each individual, goals are set by riding instructors, clients' teachers and parents. Clients' evaluations are made based on achievement and progress. Clients have fun while they achieve relaxation, physical and mental growth, improved auditory and visual abilities. Trained and loving volunteers are used for side walking and horse handling when needed. The term "hippotherapy" literally means "treatment with the help of the horse." Hippotherapy is used by licensed Physical Therapists, Occupational Therapists, and Speech-Language Pathologists to address impairments, functional limitations, and disabilities in clients with neuromusculoskeletal dysfunction. 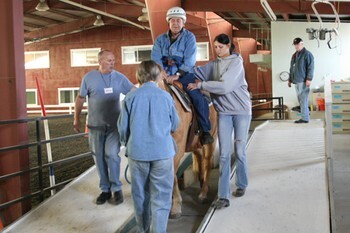 Hippotherapy is used as part of an integrated treatment program to achieve functional outcomes. In hippotherapy, the patient engages in activities on the horse that are enjoyable and challenging. In the controlled hippotherapy environment, the therapist modifies the horse's movement and carefully grades sensory input. 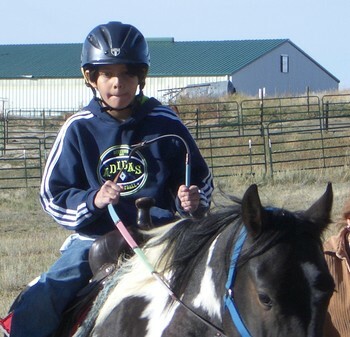 Specific riding skills are not taught (as in therapeutic horseback riding); but rather a foundation is established to improve neurological function and sensory processing. This foundation can be generalized to a wide range of daily activities. Clients in this program are required to be evaluated by our therapy department. Appointments must be arranged through PHR's office. Our OT's are Hippotherapy, Level One certified by AHA. For all things began in a garden--therefore PHR has started a sensory garden. The garden is divided into bays: Butterfly Garden, Scripture Garden, Rose Garden, and Bird Sanctuary. Each bay has wheelchair paths, plantings to see, taste, smell, feel, hear, and to enjoy. PHR's very special clients can have hands-on, sensory stimulating activities. Quiet bays with benches, etc., make private places for the therapists and clients to work together. Gross Motor Coordination: Pushing a wheelbarrow; pulling a rake or hoe; weeding. Fine Motor Coordination: Planting and spacing seeds of varying sizes and the proper depth; flower arranging. Eye-Hand Coordination: Watering flower pots; filling pots with soil. Tactile: Differentiation of texture and form; removing dead leaves, bud tips, etc. Spatial Relations: Determining size to dig hole for a root ball and spacing plants. Position in Space: Dropping seeds in rows; watering. A positive step forward in learning to care for others, to touch (tactile, sensory integration), and to be courageous in establishing personal relationships with animals and people. Clients are unconditionally loved by animals. Specially designed programs in cooperation with group home adolescent centers. This includes working on maintenance of the ranch, animal husbandry, bonding with animals, learning basic horsemanship, and learning to volunteer with handicapped children and adults. Hard physical work relieves stress and teaches them to use their strength and aggressions appropriately. Feeding and caring for animals becomes a responsibility, and these youth are unconditionally accepted. Choosing a horse to care for, to tack, and learn to ride builds a sense of self-esteem and acceptance of another's authority. Some will graduate to a Peer-Tutor Program where they will step into shoes of authority themselves, and learn to serve others. 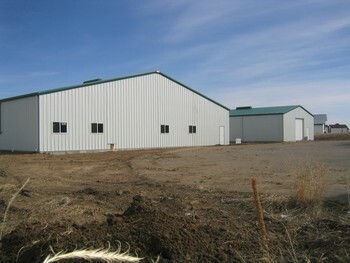 The Veterans Administration visited PHR and commented that this is a very appropriate facility. Two Electric lifts have been installed in the indoor riding arenas for assisting the mounting of clients who need assistance. PHR has added large and strong horses to use in these programs and with the help of many donations we have a new Independence Saddle. The Independent Strides saddle is particularly well-suited for use by individuals with disabilities. It can be used with any combination of six attachments, or alone, and can be individualized by adding or removing components to maximize the therapeutic benefits. It also was developed with the primary concern for safety, complying with PATH International's safety standards. Praying Hands Ranch is pleased to announce that we are able to assist Spanish speaking families who may be interested in equine therapeutic riding or hippotherapy. El Rancho Praying Hands tiene el gusto de annuciar que podemos asistir a las familias que hablan espanol que pueden ser interesadas en el montar a caballo terapeutico equino o hippotherapy. Por mas de veinte anos, El Rancho Praying Hands (PHR) ha trabajado para resolver las necesidades de ninos y adultos perjudicados en un ambiente terapeutico del rancho. Los instructores estan certificados por la asociacion de montar a caballo para los inabilitados de norte america (NARHA). Las edades de los clientes se extienden a partir de 24 meses a 60 anos. Servimos a todos los clientes perjudicados que han sido aprobados por sumedico para participar enterapeutico equino del PHR o en el programa de Hippoterapy (llame por favor ala oficina del PHR para las formas y la informacion medicas). Inabilitados incluyen, pero no limitadosa: Paralisis cerebral, Spina fifido, Autism, inhabilitado emociionalmente, Sindrome Downs, haber perjudicado multiple, Hydrocephalic, esclerosis multiple, danos de cerebro, y movimiento. Par mas informacion con respecto a nuestros programas o la ayuda con el proceso del registro del cliente anticipado, entre en contacto por favor con el rancho en 303-841-4043 o hansonphr@myawai.com , o para informacion o asistencia en espanol entre en contacto con la voluntaria de PHR Elizabeth Killebrew en 303-504-9848 o johnbeth42@msn.com. Harness Driving is another program option at PHR. Carriage driving is in some ways more suitable than riding for some disabled people. 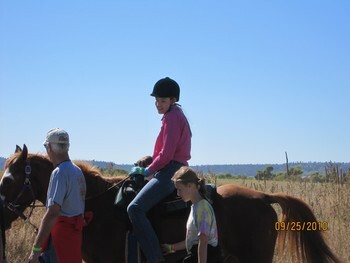 It is an asset to any therapeutic riding program. Opportunities for those who are unable to ride astride a horse and presents an enjoyable sporting event. Driving a horse offers clients a sense of independence and accomplishment. Opportunities for wheelchair clients to learn to rely entirely on hand and voice commands to make his/her wishes known to the horse. Develops the client's confidence and self-esteem. Develops sensory and visual integration. Strengthens arms and hands and enchances cognitive skills. Equine Therapeutic Riding Session Dates, please call PHR office at 303-841-4043 to sign up. 2019 Volunteer Training Dates (9:00 to 3:00), please call PHR office, 303-841-4043 to sign up. All prospective Clients must register by filling out a prospective client form, you may send a letter (see below) by mail or fax (720) 851-7679. Classes are one hour in length and are generally held from 10:00 a.m. until 5:30 p.m. Some days we have late afternoon classes available, depending on our clients' needs. Equine sessions with riding instructors are eight weeks long and are Winter, Spring, Summer, Fall and one short 4 or 5 week session in November-December. Hippotherapy sessions on a one-to-one basis with a therapist are ongoing. Registrations are now being taken. An Occupational Therapist evaluation may be necessary before assigning a client to a class, so please include any personal information that would help us to place your client's special needs in Equine or Hippotherapy programs.